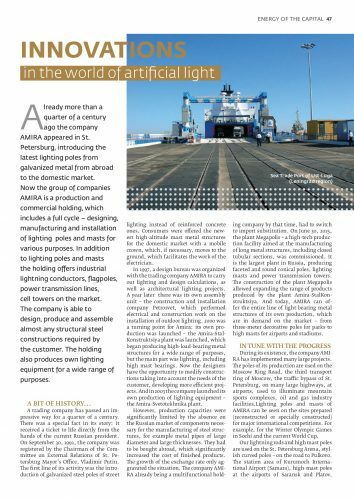 JSC AMIRA is featured in the July issue of the federal journal “Russian Business Guide”. The main theme of this issue is development of business in Moscow. The Chamber of Commerce and Industry of Russian Federation and the Chamber of Commerce and Industry of Moscow, flagships of different industries were invited to participate in preparing of the issue. Thanks for the more than 27 years experience JSC AMIRA can represent not only the main landmarks of its development but the modern lighting industry. The federal journal “Russian Business Guide” is the only Russian business-guide in foreign countries. The journal is published since 2006. It’s supporting by the Chamber of Commerce and Industry of Russian Federation and the Ministry of Foreign Affairs of the Russian Federation. The issue includes articles in Russian and English.